The invention relates to the field of medicine, in particular to an oleanolic acid derivative shown as a formula I, and pharmaceutically acceptable salts, a preparation method and purpose thereof. 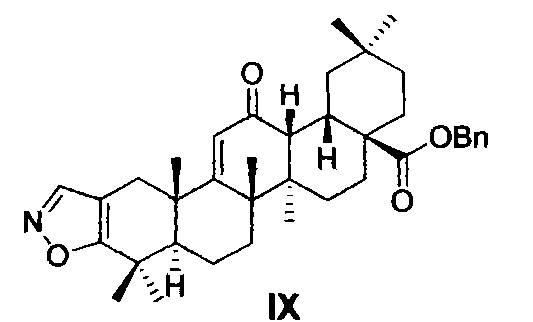 The invention also discloses application of the compound shown by the formula I to the preparation of anti-tumor medicine of 2-cyano-3, 12-dioxo oleanane-1, 9(11)-diene-28-carboxylic acid (XI, CDDO), 2-cyano-3, 12-dioxo oleanane-1, 9(11)-diene-28-carboxylic imidazole (XIII, CDDO-Im) and 2-cyano-3, 12-dioxo oleanane-1, 9(11)-diene-28-carboxyl methylamine (XIV, CDDO-MA). 本发明涉及药物领域，具体涉及一种式（I)所示的齐墩果酸衍生物或其药学上可接受的盐、其制备方法。  The present invention relates to the pharmaceutical field, particularly, to a formula (I) pharmaceutically oleanolic acid derivative or a pharmaceutically acceptable salt thereof, methods for their preparation. 本发明还进一步涉及式（I)所示的化合物在制备抗肿瘤药物2-氰基-3，12- 二氧代齐墩果烷-1，9 (11)- 二烯-28-羧酸（⑶DO)、2_氰基-3，12- 二氧代齐墩果烷-1,9(11)-二烯-28-羧酰咪唑(CDDO-Im)和2-氰基-3，12-二氧代齐墩果烷-1， 9 (11)-二烯-28-羧酰甲胺（OTDO-MA)中的应用。 The present invention further relates to formula (I) are illustrated in preparing antitumor 2-cyano-3,12-dioxo-oleanane-1,9 (11) - diene -28- carboxylic acid ( ⑶DO), 2_ cyano-3,12-dioxo-oleanane-1,9 (11) - diene -28- imidazole carboxylic acid (CDDO-Im) and 2-cyano-3,12 oleanane dioxo-1, 9 (11) - application of diene -28- carboxylic acid methylamine (OTDO-MA) in. 以齐墩果酸（oleanolic acid, OA)为代表的齐墩果烷型（oleanane)五环三萜化合物在自然界普遍存在，并具有广泛的生物活性（Neoplasma，2004，51，327-333)，基于这些天然化合物结构的优化和衍生是天然药物化学研究的热点之一。  The oleanolic acid (oleanolic acid, OA) represented oleanane type (oleanane) pentacyclic triterpenoid compounds ubiquitous in nature, and having a wide range of biological activity (Neoplasma, 2004,51,327- 333), and optimization based on these natural compounds derived from one of the hot structure of natural medicine chemistry. 2-氰基-3，12-二氧代齐墩果烷-1,9(11)-二烯-28-羧酸（CDDO)是对齐墩果酸进行结构改造而获得的具有优良抗炎及抗肿瘤活性的齐墩果烷类化合物。  2-Cyano-3,12-dioxo-oleanane-1,9 (11) - diene having excellent acid -28- (of CDDO) oleanolic acid is obtained by structural transformation of oleanane compound of anti-inflammatory and anti-tumor activity. CDDO具有独特的作用机理，且安全性高，其甲酯衍生物（CDDO-Me)的药理活性与CDDO相当（Nature Reviews Cancer, 2007, 7, 357-69)。 CDDO has a unique mechanism of action and high safety, methyl ester derivative thereof (CDDO-Me) CDDO considerable pharmacological activity (Nature Reviews Cancer, 2007, 7, 357-69). 目前，CDDO-Me正处于临床研发阶段，分别用于治疗胰腺癌和慢性肾病（CKD)。 Currently, CDDO-Me is in clinical development, respectively, for the treatment of pancreatic cancer and chronic kidney disease (CKD). 以⑶DO为先导物，对其以8位羧基进行衍生化得到的2-氰基-3，12- 二氧代齐墩果烷-1,9(11)-二烯-28-羧酰咪唑(CDDO-Im)和2-氰基-3，12-二氧代齐墩果烷-1， 9(11)- 二烯-28-羧酰甲胺（CDDO-MA)，两者的药理活性均强于CDDO和CDDO-Me (Blood， 2004，103，3158-3366 ；PLoS One,2009，4，e5757)。  In ⑶DO as the lead compound, its 2-cyano-derivatized to give 8-carboxy-3,12-dioxo-oleanane-1,9 (11) - diene carboxylic -28- acyl imidazole (CDDO-Im) and 2-cyano-3,12-dioxo oleanane -1, 9 (11) - diene -28- carboxylic acid methylamine (CDDO-MA), both pharmacological activity were stronger than CDDO and CDDO-Me (Blood, 2004,103,3158-3366; PLoS One, 2009,4, e5757). 研究表明，此类化合物的以8位取代基对药理活性影响很大，因此以8位羧基是结构修饰的关键位点。  Studies have shown that such compounds, a substituent great influence on the pharmacological activity of 8 bits, 8 bits and therefore is structurally modified carboxyl key sites. 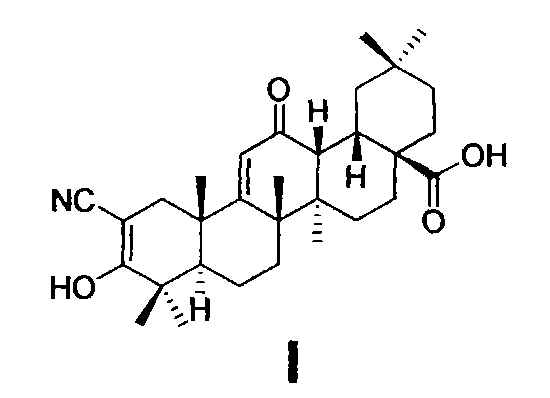 然而，目前有关CDDO的合成方法（W0 9965478 Jouranl of Medicinal Chemistry, 2000,43,4233)存在一定缺陷。 However, the method of synthesis of CDDO (W0 9965478 Jouranl of Medicinal Chemistry, 2000,43,4233) some defects. CDDO原开发者美国达特茅斯学院的Honda等人也坦诚，现有的合成问题已严重影响到⑶DO衍生物的进一步研究与开发（Bioorganic Medicinal Chemistry Letters，2002，12，1027-1030)。 CDDO original developer Honda et Dartmouth College who also frank, conventional synthesis problem has seriously affected the further research and development ⑶DO derivatives (Bioorganic Medicinal Chemistry Letters, 2002,12,1027-1030). 上述CDDO合成路线主要存在下列缺点：①由于齐墩果酸分子中的以8位羧基处于母核大位阻屏蔽区，反应活性低，因此在步骤a中需要使用碘甲烷或者重氮甲烷才能顺利进行甲酯化反应。  The CDDO Scheme main following drawbacks: ① Since oleanolic acid molecule to the nucleus in 8-carboxy sterically hindered shielded area, low reactivity, it is necessary to use methyl iodide in step a diazo or methyl methane reaction can proceed smoothly. 然而，这些试剂存在价格昂贵、易燃易爆、剧毒及难以保存等缺点；②步骤k涉及CDDO-Me的以8位羧酸甲酯的水解，它在常规的酸或碱性条件下不能顺利进行，需要使用昂贵的无水碘化锂作试剂，并在无水DMF中长时间回流才能完成。 However, there is expensive, flammable, toxic, and difficult to keep these agents shortcomings; ② step k relates to the hydrolysis of CDDO-Me 8-carboxylate, which is not under conventional acidic or basic conditions smooth, it requires the use of expensive anhydrous lithium iodide as a reagent, and a long time to complete reflux in anhydrous DMF. 同时，该反应的后处理繁琐，需要柱层析、重结晶等多步操作。 Meanwhile, the post-treatment reaction is tedious, requires column chromatography, recrystallization and the like multi-step operation. 因此，C28位羧基的“保护与脱保护”是这条合成路线最需要改进的地方。 Thus, C28 carboxyl group of "protecting and deprotecting" This synthetic route is most in need of improvement. 本发明首次公开了一种齐墩果酸衍生物（I)或其药学上可接受的盐、其制备方法及用途。  The present invention discloses for the first time an oleanolic acid derivative (I) or a pharmaceutically acceptable salt thereof, their preparation and use. 本发明化合物的制备方法具有反应收率高、生产成本低、以及反应条件温和等特点。 Preparation of the compounds of the present invention has high reaction yield, low production cost, mild reaction conditions, and so on. 本发明的化合物可用于制备抗肿瘤药物⑶DO、⑶DOHm及⑶D0-MA。 Compounds of the invention can be used in preparing antitumor ⑶DO, ⑶DOHm and ⑶D0-MA. (5)式（V)化合物经碱性水解反应制得式（VI)所示的3 β -羟基-12-氧代齐墩果烷-9 (11)-烯-28-羧酸苄酯；采用的碱性化合物选自氢氧化钠或氢氧化钾；采用的反应时间为1-12小时。  Compound (5) of formula (V) by basic hydrolysis reaction of formula (VI) 3 β shown - hydroxy-12-oxo-oleanane-9 (11) - en-28-carboxylic acid benzyl ester; a basic compound used is selected from sodium or potassium hydroxide; the reaction time employed is 1 to 12 hours. 制备式（IV)化合物的特征在于，采用的氧化试剂优选双氧水；采用的溶剂优选甲酸和二氯甲烷混合溶剂；采用的反应时间为M小时。 The compounds of  Formula (IV) wherein, preferably using hydrogen peroxide oxidizing agent; mixed solvent employed preferably formic acid and dichloromethane; reaction time employed is M hours. 制备式（V)化合物的特征在于，Br2的投料量为式（IV)化合物的3当量；采用的溶剂优选乙酸；采用的反应温度为25〜50°C ；采用的反应时间为M小时。 The compounds of  Formula (V) in that the feeding amount of Br2 formula (IV) 3 equivalent of the compound; preferably acetic acid solvent employed; the reaction temperature employed is 25~50 ° C; reaction time employed is M hour. 制备式（VI)化合物的特征在于，采用的碱性化合物优选氢氧化钾；采用的反应时间为1小时。 The compounds of  formula (VI) wherein the basic compound used is preferably potassium hydroxide; the reaction time used was 1 hour. 制备式（VII)化合物的特征在于，采用的氧化剂优选Jones试剂；采用的溶剂优选丙酮；采用的反应时间为20分钟。  Preparation of Formula (VII) compound characterized in that the oxidizing agent is preferably used Jones reagent; preferably acetone solvent employed; the reaction time used was 20 minutes. 制备式（VIII)化合物的特征在于，采用的碱性试剂优选甲醇钠；采用的溶剂优选二氯甲烷；采用的反应时间为12小时。 The compounds of  Formula (VIII) in that the alkaline agent employed preferably sodium methoxide; preferably the solvent employed is methylene chloride; reaction time employed is 12 hours. 制备式（IX)化合物的特征在于，采用的Pd-C中Pd的含量为10% ；采用的溶剂优选四氢呋喃；采用的反应时间为5小时。 The compounds of  formula (IX) wherein, Pd-C employed in an amount of 10% Pd; of the solvent, preferably tetrahydrofuran; the reaction time was 5 hours employed. 制备式（I)化合物的特征在于，采用的碱性试剂优选甲醇钠；采用的溶剂优选甲醇和乙醚混合溶剂；采用的反应时间在1小时。 The compounds of  Formula (I) wherein, preferably methanol sodium alkaline agent employed; the solvent is preferably a mixed solvent of methanol and diethyl ether employed; the reaction time employed in one hour. 醌、四氯苯醌或二氧化硒；采用的溶剂选自苯、甲苯、二甲苯、二氧六环、乙腈、四氢呋喃或二氯甲烷；采用的反应时间为1-48小时；采用的反应温度为25-140°C。 Quinone, chloranil or selenium dioxide; used solvent selected from benzene, toluene, xylene, dioxane, acetonitrile, tetrahydrofuran or dichloromethane; reaction time employed is 1 to 48 hours; reaction temperature employed is 25-140 ° C.
 制备式（XII)化合物的特征在于，采用酰氯化试剂选自草酰氯或二氯亚砜；采用溶剂为无水二氯甲烷、无水氯仿、无水四氢呋喃、无水乙腈或无水丙酮；采用的反应时间为1-24小时；采用的反应温度为0-50°C。  Preparation of Formula (XII) compound is characterized by using acid chloride forming agent is selected from oxalyl chloride or thionyl chloride; a solvent is anhydrous dichloromethane, anhydrous chloroform, anhydrous tetrahydrofuran, anhydrous or anhydrous acetonitrile acetone; reaction time employed is 1 to 24 hours; reaction temperature employed is 0-50 ° C.
 制备式（XIII)和式（XIV)化合物的特征在于，采用的碱性试剂选自三乙胺、吡啶或4-二甲氨基吡啶；采用溶剂为无水二氯甲烷、无水氯仿、无水四氢呋喃、无水乙腈或无水丙酮；采用的反应时间为1-¾小时；采用的反应温度为0-50°C。 The compounds of  Formula (XIII) and formula (XIV) wherein, using an alkaline agent is selected from triethylamine, pyridine or 4-dimethylaminopyridine; the solvent is employed in anhydrous dichloromethane, anhydrous chloroform , anhydrous tetrahydrofuran, anhydrous acetone or anhydrous acetonitrile; reaction time employed is 1-¾ hour; the reaction temperature employed is 0-50 ° C.
 为了进一步阐明本发明，下面给出一系列实施例，这些实施例完全是例证性的，它们仅用来对本发明具体描述，不应当理解为对本发明的限制。  To further clarify the present invention, the following series of examples are given, these embodiments are purely illustrative, they are only used detailed description of the present invention should not be construed as limiting the present invention. 本发明所用齐墩果酸为市场购买的化学纯原料。 Oleanolic acid chemically pure raw materials market for later use of the present invention. 将齐墩果酸(100g,220mmol)和 K2CO3 (61 g，440mmol)置于DMF(800mL)中，50 〜 55°C下20分钟内滴加氯苄（33mL，290mmol)，滴毕，继续反应3〜4小时，冷却至室温，过滤， 滤饼以DMF(50mLX3)洗涤，滤液倾入冰水中（3000mL)中，有大量白色固体析出，静置待固体颗粒变大后，抽滤，收集固体，用水充分洗涤，干燥得白色固体II (114g，95. 5%)。  The oleanolic acid (100g, 220mmol), and K2CO3 (61 g, 440mmol) was placed DMF (800mL), the lower 50 ~ 55 ° C was added dropwise over 20 minutes benzyl (33mL, 290mmol), dropwise. , reaction was continued for 3 to 4 hours, cooled to room temperature, filtered, the filter cake in DMF (50mLX3), and the filtrate poured into ice water (3000 mL of), there are a lot of white solid precipitated upon standing until the solid particles is increased, suction , solid was collected, washed well with water, and dried to give a white solid II (114g, 95. 5%). 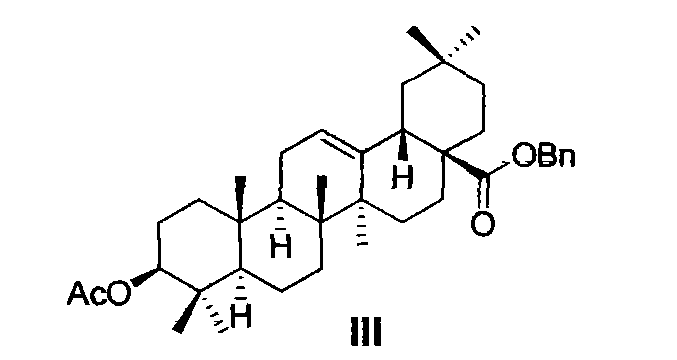 化合物II是已知化合物，其CAS号为303114-51-4。 Compound II is a known compound CAS Number 303114-51-4. 将化合物II (5. 46g，IOmmol)溶于20mL吡啶中，0〜5°C缓慢滴加乙酸酐(10. 2g， 1 OOmmol)，滴加完毕后加入DMAP (0. 12g，lmmol)，有固体析出，室温下继续反应1〜2小时， 加入适量二氯甲烷（50mL)溶解，溶液依次用5% HCl溶液，饱和碳酸氢钠溶液，饱和食盐水各洗涤3次，无水硫酸钠干燥，减压去除溶剂后得白色固体III (5. 4g，91. 3%)0化合物III 是已知化合物，其CAS号为357953-27-6。  Compound II (5. 46g, IOmmol) was dissolved in 20mL pyridine, 0~5 ° C was slowly added dropwise acetic anhydride (10. 2g, 1 OOmmol), was added DMAP (0. 12g After the addition was complete, lmmol ), solid was precipitated, the reaction was continued at room temperature for 1 to 2 hours, add appropriate amount of dichloromethane (50mL) was dissolved, the solution was washed with 5% HCl solution, saturated sodium bicarbonate solution, washed with water and saturated brine each three times, dried over anhydrous sulfate sodium sulfate, and III under reduced pressure to give a white solid after removal of the solvent (5. 4g, 91. 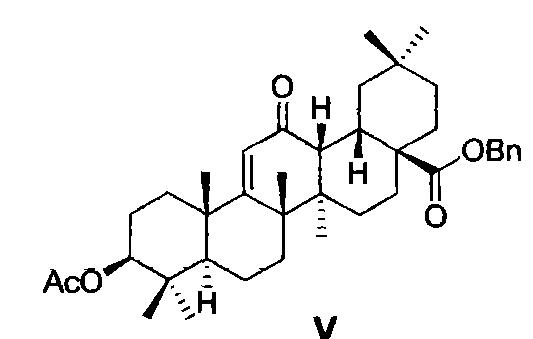 3%) 0 compound III are known compounds which CAS number 357953-27-6. 将化合物111(5. 88g，IOmmol)溶于适量二氯甲烷（50mL)，加入甲酸（IOmL)， H2O2 (1. 36g，40mmol)，室温反应M小时，TLC监测反应进程，待原料点消失后，用饱和碳酸氢钠溶液将反应液洗至近中性，饱和食盐水洗涤3次，无水硫酸钠干燥，减压去除溶剂后得浅黄色固体，AcOH-H2O重结晶得白色固体IV(4. 7g,78% )。  Compound 111 (5. 88g, IOmmol) was dissolved in an appropriate amount of dichloromethane (50 mL), was added formic acid (IOmL), H2O2 (1. 36g, 40mmol), rt M h, TLC monitored the reaction progress until the starting material after point disappears, the reaction with saturated sodium bicarbonate solution, washed to near neutral solution, three times with saturated brine, dried over anhydrous sodium sulfate, and the solvent removed under reduced pressure to give a pale yellow solid, AcOH-H2O to give a white solid was recrystallized IV (4. 7g, 78%). 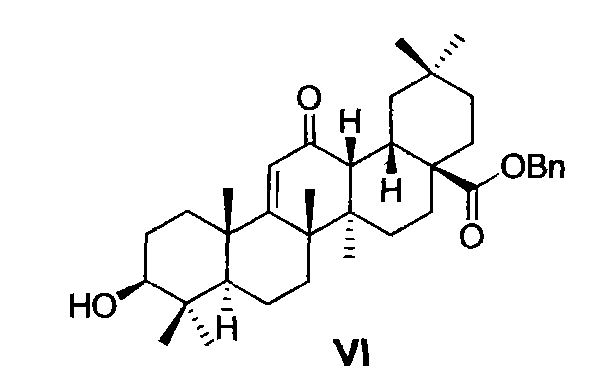 化合物IV是已知化合物，其CAS 号为；357953-28-7。 Compound IV is a known compound CAS Number; 357953-28-7. 将化合物 IV (6. 04g, IOmmol)溶于乙酸（300mL)中，滴加数滴HBr (40%，AcOH)溶液，加热至40〜45°C，缓慢滴加Br2 (1. 6g，IOmmol)的乙酸溶液，滴加完毕后，搅拌片刻，另加Br2(3.2g，20mmol)的乙酸溶液，室温下反应M小时。  Compound IV (6. 04g, IOmmol) dissolved in acetic acid (300 mL), a few drops of solution of HBr (40%, AcOH) solution was heated to 40~45 ° C, was slowly added dropwise Br2 (1. 6g , IOmmol) in acetic acid, after completion of the dropwise addition, stirred for a while, additional Br2 (3.2g, 20mmol) in acetic acid, the reaction M hour at room temperature. 反应结束后，将溶液倾入冰水中， 收集析出固体，分别用饱和亚硫酸氢钠溶液，水洗涤，烘干，得淡黄色粗品，甲醇重结晶，得白色固体V(4. 39g，79. 8% )。 After completion of the reaction, the solution was poured into ice water, the precipitated solid was collected, were washed with a saturated sodium bisulfite solution, washed with water and dried to give a pale yellow crude product was recrystallized from methanol to give a white solid V (4. 39g, 79. 8% ). 1HNMR(300M Hz, CDCl3, 25°C，TMS) ： δ 7. 34-7. 26 (m, 5H), 5. 7 (s, 1H), 5. 16 (d, J = 12. 6Hz，1H)，5· 11 (d, J = 12. 6Hz, 1H) ,4. 46 (m, 1H), 3. 03 (m, 1H), 2. 93 (d, J = 4. 5Hz，lH)， 2. 05(s，3H)，2. 01，1. 57，1. 16，1. 00,0. 95,0. 92,0. 89 (s, each 3H) ppm. 1HNMR (300M Hz, CDCl3, 25 ° C, TMS):. Δ 7. 34-7 26 (m, 5H), 5. 7 (s, 1H), 5. 16 (d, J = 12. 6Hz, 1H), 5 · 11 (d, J = 12. 6Hz, 1H), 4. 46 (m, 1H), 3. 03 (m, 1H), 2. 93 (d, J = 4. 5Hz, lH), 2. 05 (s, 3H), 2. 01,1. 57,1. 16,1. 00,0. 95,0. 92,0. 89 (s, each 3H) ppm. 将化合物 V(6. 02g，IOmmol)，KOH(33. 6g,600mmol)溶于甲醇（300mL)，加热回流1小时，减压去除溶剂，剩余固体用6mol/L的HCl溶液洗至近中性，水层用二氯甲烷(IOOmLX3)提取，有机层用饱和碳酸氢钠溶液，饱和食盐水各洗涤3次，无水硫酸钠干燥， 减压去除溶剂后得白色固体VI (5. 32g，95% )。  Compound V (6. 02g, IOmmol), KOH (33. 6g, 600mmol) was dissolved in methanol (300 mL), refluxed for 1 hour, the solvent was removed under reduced pressure, the residual solid was 6mol / L HCl solution washed to near neutral, the aqueous layer was extracted with dichloromethane (IOOmLX3), the organic layer was washed with saturated sodium bicarbonate solution, washed with water and saturated brine each three times, dried over anhydrous sodium sulfate, and under reduced pressure to give a white solid VI (5. 32g after removing the solvent , 95%). 1HNMR(300M Hz, CDCl3, 25°C，TMS) ： δ 7. 34-7. 26 (m, 5H), 5. 7 (s, 1H), 5. 16 (d, J = 12. 6Hz, 1H), 5. 11 (d, J = 12. 6Hz, 1H)，3. 22-3. 17 (m, 1H)，3. 03 (m, 1H)，2. 25 (d, J = 4. 5Hz, 1H)，1. 14，1.02，1.00,0.96,0.92,0. 89,0.81 (s，each 3H) ppm. 1HNMR (300M Hz, CDCl3, 25 ° C, TMS):. Δ 7. 34-7 26 (m, 5H), 5. 7 (s, 1H), 5. 16 (d, J = 12. 6Hz, 1H), 5. 11 (d, J = 12. 6Hz, 1H), 3. 22-3. 17 (m, 1H), 3. 03 (m, 1H), 2. 25 (d, J = 4. 5Hz, 1H), 1. 14,1.02,1.00,0.96,0.92,0. 89,0.81 (s, each 3H) ppm. 将化合物VI (5. 6g，1 Ommol)溶于丙酮QOOmL)中，0°C下缓慢滴加琼斯试剂(3. 8mL)，滴加完毕后室温反应10〜20分钟，TLC监测反应进程。  Compound VI (5. 6g, 1 Ommol) was dissolved in acetone QOOmL), the 0 ° C under Jiaqiong Si reagent was slowly added dropwise (3. 8mL), After the addition was complete the reaction at room temperature 10-20 minutes, the reaction was monitored by TLC process. 待原料点。 To be material points. C失后，减压去除溶剂，加水至残留物中，用二氯甲烷（100mLX3)提取，有机层用饱和碳酸氢钠溶液，饱和食盐水各洗涤3次，无水硫酸钠干燥，减压去除溶剂后得淡棕色固体，快速硅胶柱层析制得白色固体VII (4. 9g,88% )。 After the loss of C, the solvent was removed under reduced pressure, water was added to the residue and extracted with dichloromethane (100 ml x 3), the organic layer was washed with saturated sodium bicarbonate solution, washed with water and saturated brine each three times, dried over anhydrous sodium sulfate, and removed under reduced pressure to give a light brown solid, flash silica gel chromatography as a white solid after solvent VII (4. 9g, 88%). 1HNMR(300M Hz, CDCl3, 25°C，TMS) ： δ 7. 38-7. 28 (m, 5Η), 5. 8 (s, 1Η), 5. 16 (d, J =12. 6Ηζ，1Η)，5· 11 (d, J = 12. 6Hz，lH，)，3· 06 (m，1Η)，2· 78 (d, J = 4. 5Ηζ，1Η)，2· 66,2. 49， 2. 17 (m, each 1Η)，1. 26,1. 11，1. 07,1. 00,0. 97,0. 95,0. 89 (s, each 3H) ppm. 1HNMR (300M Hz, CDCl3, 25 ° C, TMS):. Δ 7. 38-7 28 (m, 5Η), 5. 8 (s, 1Η), 5. 16 (d, J = 12. 6Ηζ, 1Η), 5 · 11 (d, J = 12. 6Hz, lH,), 3 · 06 (m, 1Η), 2 · 78 (d, J = 4. 5Ηζ, 1Η), 2 · 66,2 . 49, 2. 17 (m, each 1Η), 1. 26,1. 11,1. 07,1. 00,0. 97,0. 95,0. 89 (s, each 3H) ppm. 将化合物VII(5. 58g，10mmol)溶于干燥的二氯甲烷中，0°C加入新制甲醇钠(3. Mg，60mmol)，形成混悬液，搅拌片刻后，缓慢滴加甲酸乙酯（3. 33g，45mmol)，室温反应12小时，TLC监测，反应结束后，0°C下调节反应液pH值至中性，二氯甲烷稀释，有机层用饱和碳酸氢钠溶液，饱和食盐水各洗涤3次，无水硫酸钠干燥，减压去除溶剂后得淡黄色固体，经快速硅胶柱层析制得白色固体VIII (5. 3g，90. 2% )。 After  Compound VII (5. 58g, 10mmol) was dissolved in dry dichloromethane, 0 ° C was added freshly prepared sodium methoxide (3. 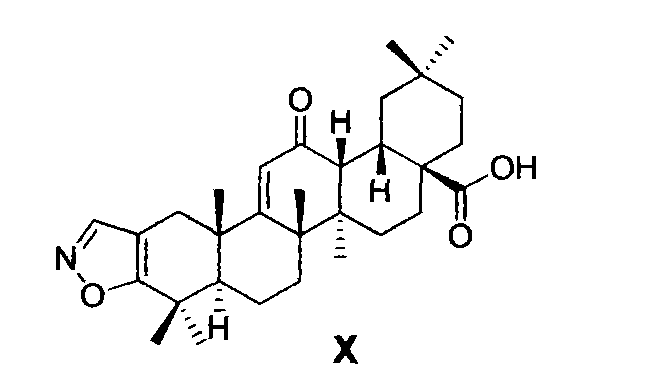 Mg, 60mmol), to form a suspension, stirring the mixture was slowly added dropwise formic acid ethyl ester (3. 33g, 45mmol), at room temperature for 12 h, TLC monitoring, after the completion of the reaction, the reaction 0 ° C for adjusting the pH value to neutrality, diluted with dichloromethane, the organic layer was washed with saturated sodium bicarbonate solution, saturated each was washed three times with brine, dried over anhydrous sodium sulfate, and under reduced pressure to give a light yellow solid after removal of the solvent, by flash silica gel chromatography as a white solid VIII (5. 3g, 90. 2%). 1. 15，1. 14，1. 01,0. 98,0. 94,0. 85 (s, each 3H) ppm. 1. 15,1. 14,1. 01,0. 98,0. 94,0. 85 (s, each 3H) ppm. 将化合物 VIII (5. 8g，IOmmol)，盐酸羟胺（6. 95g，IOOmmol)溶于乙醇(95% )100mL，加热回流1小时，反应完毕。  Compound VIII (5. 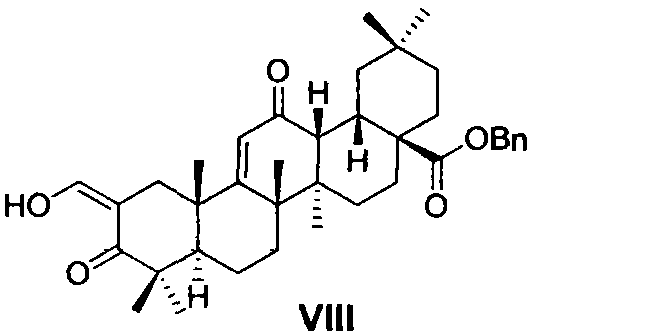 8g, IOmmol), hydroxylamine hydrochloride (6. 95g, IOOmmol) was dissolved in ethanol (95%) 100mL, refluxed for 1 hour, the reaction was complete. 旋干反应液，残留物乙酸乙酯（50mL)溶解，有机层用饱和碳酸氢钠溶液，饱和食盐水各洗涤3次，无水硫酸钠干燥，减压去除溶剂后得白色固体IX(4. 8g，82. 7% )。 The reaction solution by rotary evaporation, the residue in ethyl acetate (50mL) was dissolved, and the organic layer was washed with saturated sodium bicarbonate solution, washed with water and saturated brine each three times, dried over anhydrous sodium sulfate, and under reduced pressure to give a white solid IX (4 after removal of the solvent. 8g, 82. 7%). 2. 75 (d, J = 15Hz, 1H)，3. 38 (d, J = 15Hz, 1H)，1. 37，1. 26，1. 12，1. 01,0. 99,0. 95,0. 90 (s, each 3H) ppm. 2. 75 (d, J = 15Hz, 1H), 3. 38 (d, J = 15Hz, 1H), 1. 37,1. 26,1. 12,1. 01,0. 99,0. 95, 0. 90 (s, each 3H) ppm. 1HNMR (300Μ Hz, CDCl3, 25 °C，TMS) ： δ 8. 05 (s，1H)，5. 8 (s，1H)，3. 03 (m，1H)， 2. 93 (d, J = 4. 5Hz, 1H)，2. 78 (d, J = 15. 3Hz, 1H)，2. 40 (d, J = 15. 3Hz, 1H)，1. 35，1. 31， 1. 26,1. 16,1. 01,0. 97,0. 85 (s, each 3H) ppm. 1HNMR (300Μ Hz, CDCl3, 25 ° C, TMS):.. Δ 8. 05 (s, 1H), 5 8 (s, 1H), 3 03 (m, 1H), 2. 93 (d , J = 4. 5Hz, 1H), 2. 78 (d, J = 15. 3Hz, 1H), 2. 40 (d, J = 15. 3Hz, 1H), 1. 35,1. 31, 1. 26,1. 16,1. 01,0. 97,0. 85 (s, each 3H) ppm. 2-氰基-3-羟基-12-氧代齐墩果烷-2 (3) ,9(11)-二烯-28-羧酸⑴的制备 将化合物X (0. 49g，Immo 1)，溶于甲醇6mL，乙醚12mL，0°C下加入甲醇钠(1. 62g， 30mmol)，室温反应1小时，二氯甲烷稀释，用5%稀盐酸酸化，有机层用饱和碳酸氢钠洗3 次，饱和食盐水洗3次，无水硫酸钠干燥。  2-cyano-3-hydroxy-12-oxo-oleanane-2 (3), 9 (11) - diene-carboxylic ⑴ -28- Preparation  Compound X (0. 49g, Immo 1), was dissolved in 6 mL methanol, diethyl ether 12mL, 0 ° C sodium methoxide (1. 62g diluted with dichloromethane added, 30mmol), at room temperature for 1 hour, acidified with 5% dilute hydrochloric acid, the organic layer was washed with saturated sodium bicarbonate 3 times, washed three times with brine, dried over anhydrous sodium sulfate. 减压去除溶剂后得淡黄色固体I (0. 44g,89% )。 To give a light yellow solid I (0. 44g, 89%) after removal of the solvent under reduced pressure. 1HNMR (300M Hz, CDCl3, 25 °C，TMS) ： δ 8. 01 (s，1H)，5. 9 (s，1H)，3. 03 (m，1H)， 2. 93(d, J = 4. 5Hz, 1H)，2. 41(d，J = 9. OHz, 1H)，2. 26(d, J = 9. OHz, 1H)，1. 26，1. 21，1. 24， 1.20,1. 16,1.00,0. 91 (s, each 3H)ppm. 1HNMR (300M Hz, CDCl3, 25 ° C, TMS):.. Δ 8. 01 (s, 1H), 5 9 (s, 1H), 3 03 (m, 1H), 2. 93 (d , J = 4. 5Hz, 1H), 2. 41 (d, J = 9. OHz, 1H), 2. 26 (d, J = 9. OHz, 1H), 1. 26,1. 21,1. 24, 1.20,1. 16,1.00,0. 91 (s, each 3H) ppm. 将化合物 1(0. 25g，0. 51mmol)和二氰二氯苯醌(DDQ) (0. 25g,0. 51mmol)溶于20mL无水苯中，加热回流20分钟，反应结束后，过滤，滤液浓缩，快速柱层析得白色固体XI (0. 23g，91. 1% ),化合物XI是已知化合物，其CAS号为218600-44-3。  Compound 1 (0. 25g, 0. 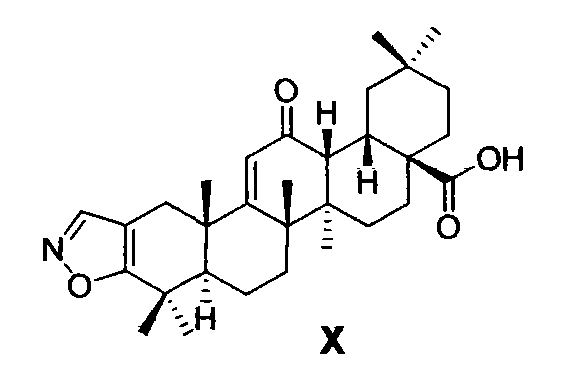 51mmol) and dicyandiamide chloranil (DDQ) (0. 25g, 0. 51mmol) was dissolved in 20mL of dry benzene and heated to reflux for 20 minutes after completion of the reaction , filtered and concentrated, flash chromatography to give white solid XI (0. 23g, 91. 1%), compound XI is a known compound CAS number 218600-44-3. 1HNMR (300M Hz，CDCl3, 25°C，TMS) ： δ 8. 05 (1Η, s), 5. 99 (1Η, s), 3. 03-2. 98 (2H,m), 1. 55，1. 38，1. 34，1. 22，1. 00,0. 91,0. 85 (each 3Η, s, CH3) ppm. 1HNMR (300M Hz, CDCl3, 25 ° C, TMS): δ 8. 05 (1Η, s), 5. 99 (1Η, s), 3. 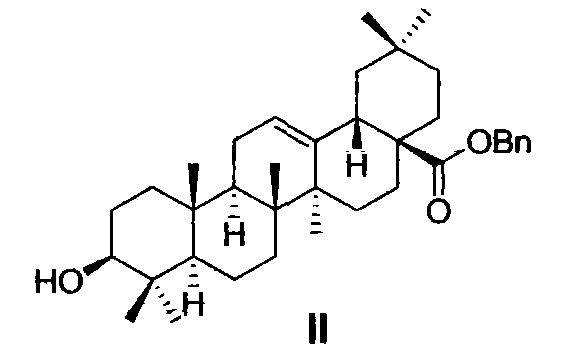 03-2 98 (2H, m), 1. . 55,1. 38,1. 34,1. 22,1. 00,0. 91,0. 85 (each 3Η, s, CH3) ppm. 将化合物1(0. 25g，0. 51mmol)溶于20mL无水二氯甲烷中，0°C下缓慢滴加草酰氯（0.64g，5. lmmol)，室温反应12小时，反应结束后，反应液浓缩得黄色固体XII (0. 23g， 89. 5% )。  Compound 1 (0. 25g, 0. 51mmol) was dissolved in 20mL anhydrous dichloromethane, 0 ° C under slowly added dropwise oxalyl chloride (0.64g, 5. Lmmol), the reaction temperature for 12 hours, the reaction after the reaction mixture was concentrated to give a yellow solid XII (0. 23g, 89. 5%). 将化合物XII(0. 23g，0. 45mmol)溶于IOmL无水二氯甲烷中，0°C下缓慢滴加咪唑(0. 03g，0. 45mmol)和三乙胺(0. 09g，0. 9mmol)的二氯甲烷溶液（5mL)，室温反应1-4小时， 反应结束后，反应液用适量二氯甲烷稀释，有机层分别用5%稀盐酸、饱和碳酸氢钠洗、饱和食盐水各洗涤3次，无水硫酸钠干燥，浓缩，快速柱层析得白色固体XIII (0. 20g，82. 1%)0 化合物XIII是已知化合物，其CAS号为443104-02-7。  Compound XII (0. 23g, 0. 45mmol) was dissolved in anhydrous dichloromethane IOmL, was slowly added dropwise 0 ° C under imidazole (0. 03g, 0. 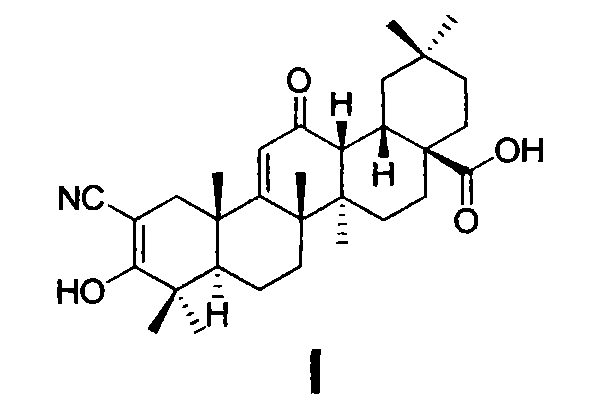 45mmol) and triethylamine (0. 09g , 0. 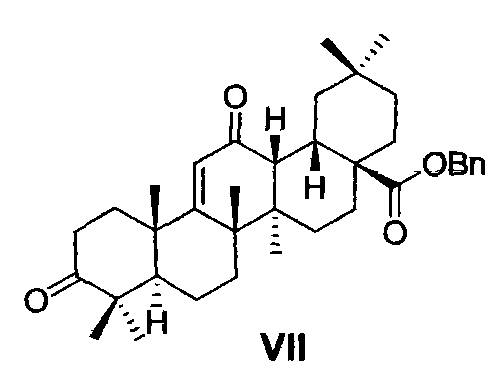 9mmol) in dichloromethane (5 mL), stirred at rt for 1-4 hours, after the completion of the reaction, the reaction solution was diluted with an appropriate amount of dichloromethane, the organic layers were washed with 5% hydrochloric acid, saturated sodium bicarbonate, saturated each was washed three times with brine, dried over anhydrous sodium sulfate, and concentrated to give a white solid XIII flash chromatography column (0. 20g, 82. 1%) 0 compound XIII is a known compound CAS number 443104-02-7 . 参照化合物XIII的合成方法（实施例12)，由化合物XII (0. 23g，0. 45mmol)与甲胺盐酸盐(0. 03g，0. 45mmol)、三乙胺(0. 13g, 1. 35mmol)反应制备得白色固体XIV(0. 18g， 80. 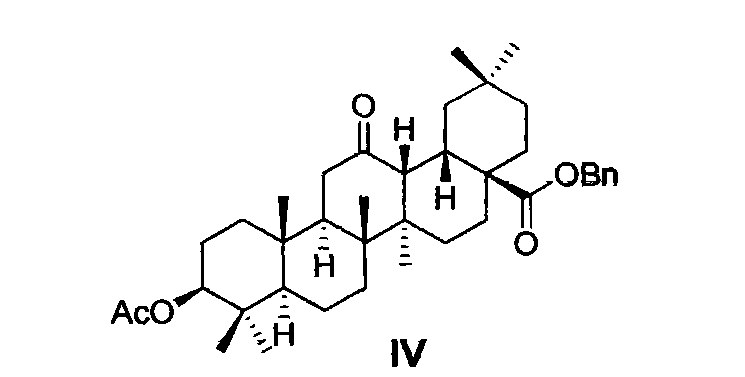 1% )0化合物XIV是已知化合物，其CAS号为443103-35-3。  Referring to the synthesis method of Compound XIII (Example 12), Compound XII (0. 23g, 0. 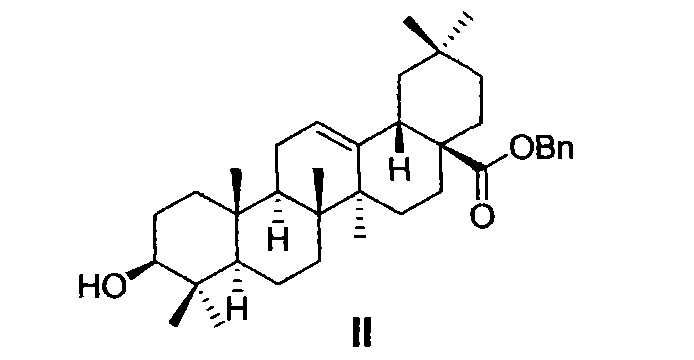 45mmol) and methylamine hydrochloride (0. 03g, 0. 45mmol), triethylamine (0. 13g , 1. 35mmol) as a white solid was prepared by reacting XIV (0. 18g, 80. 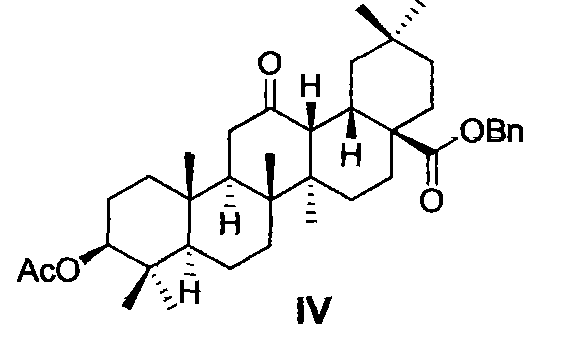 1%) 0 compound XIV are known compounds which CAS number 443103-35-3. (5)式（V)化合物经碱性水解反应制得式（VI)所示的3β-羟基-12-氧代齐墩果烷-9 (11)-烯-28-羧酸苄酯；采用的碱性化合物选自氢氧化钠或氢氧化钾；采用的反应时间为1-12小时。 Compound (5) of formula (V) by basic hydrolysis reaction of the formula (VI) 3β- shown oxo-12- oleanane substituting 9 (11) - en-28-carboxylate; using a basic compound selected from sodium hydroxide or potassium hydroxide; the reaction time employed is 1 to 12 hours. 3.根据权利要求2所述的方法，制备式（II)化合物的特征在于，采用的碱性试剂优选碳酸钾；采用的苄基化试剂优选氯化苄；采用的溶剂优选N，N-二甲基甲酰胺；采用的反应时间为4小时。 The method according to claim 2, wherein the compound of formula (II) wherein, preferably potassium carbonate alkaline agent employed; benzylating agent employed is preferably benzyl chloride; used solvent is preferably N, N- two dimethylformamide; reaction time of 4 hours was used. 4.根据权利要求2所述的方法，制备式（IV)化合物的特征在于，采用的氧化试剂优选双氧水；采用的溶剂优选甲酸和二氯甲烷混合溶剂；采用的反应时间为M小时。 4. The method according to claim 2, wherein the compound of formula (IV) wherein, preferably using hydrogen peroxide oxidizing agent; mixed solvent employed preferably formic acid and dichloromethane; reaction time employed is M hours. 4.根据权利要求2所述的方法，制备式（V)化合物的特征在于，Br2的投料量为式（IV) 化合物的3当量；采用的溶剂优选乙酸；采用的反应温度为25〜50°C ；采用的反应时间为24小时。 4. The method according to claim 2, wherein the compound of formula (V) in that the feeding amount of Br2 formula (IV) 3 equivalent of the compound; preferably acetic acid solvent employed; the reaction temperature employed is 25~50 ° C; reaction time employed is 24 hours. 5.根据权利要求2所述的方法，制备式（VI)化合物的特征在于，采用的碱性化合物优选氢氧化钾；采用的反应时间为1小时。 5. The method according to claim 2, wherein the compound of formula (VI) wherein the basic compound used is preferably potassium hydroxide; the reaction time used was 1 hour. 6.根据权利要求2所述的方法，制备式（VII)化合物的特征在于，采用的氧化剂优选Jones试剂；采用的溶剂优选丙酮；采用的反应时间为20分钟。 6. The method according to claim 2, wherein the compound of formula (VII) wherein, the oxidizing agent employed is preferably Jones reagent; preferably acetone solvent employed; the reaction time used was 20 minutes. 7.根据权利要求2所述的方法，制备式（VIII)化合物的特征在于，采用的碱性试剂优选甲醇钠；采用的溶剂优选二氯甲烷；采用的反应时间为12小时。 7. A method according to claim 2, wherein the compound of formula (VIII) in that the alkaline agent employed preferably sodium methoxide; preferably the solvent employed is methylene chloride; reaction time employed is 12 hours. 8.根据权利要求2所述的方法，制备式⑴化合物的特征在于，采用的Pd-C中Pd的含量为10% ；采用的溶剂优选四氢呋喃；采用的反应时间为5小时。 The method according to claim 2, characterized in that the compound of formula ⑴, Pd-C employed in an amount of 10% Pd; of the solvent, preferably tetrahydrofuran; the reaction time was 5 hours employed. 9.根据权利要求2所述的方法，制备式（I)化合物的特征在于，采用的碱性试剂优选甲醇钠；采用的溶剂优选甲醇和乙醚混合溶剂；采用的反应时间在1小时。 9. The method as claimed in claim 2, wherein the compound of formula (I) wherein, alkaline agent preferably sodium methoxide employed; ether solvent, preferably methanol and a mixed solvent employed; employed in the reaction time 1 hour. 四氯苯醌或二氧化硒；采用的溶剂选自苯、甲苯、二甲苯、二氧六环、乙腈、四氢呋喃或二氯甲烷；采用的反应时间为1-48小时；采用的反应温度为25-140°C ；制备式（XII)化合物的特征在于，采用的酰氯化试剂选自草酰氯或二氯亚砜；采用溶剂为无水二氯甲烷、无水氯仿、无水四氢呋喃、无水乙腈或无水丙酮；采用的反应时间为1-24小时；采用的反应温度为0-50°C ；制备式（XIII)和式（XIV)化合物的特征在于，采用的碱性试剂选自三乙胺、吡啶或4-二甲氨基吡啶；采用溶剂为无水二氯甲烷、无水氯仿、无水四氢呋喃、无水乙腈或无水丙酮；采用的反应时间为1-¾小时；采用的反应温度为0-50°C。 Selenium dioxide or chloranil; solvent selected from benzene, toluene, xylene, dioxane, acetonitrile, tetrahydrofuran or dichloromethane have been used; reaction time employed is 1 to 48 hours; reaction temperature employed is 25 -140 ° C; wherein the compound of formula (XII) in that the acid chloride forming agent is selected from oxalyl chloride or thionyl chloride employed; a solvent is anhydrous dichloromethane, anhydrous chloroform, anhydrous tetrahydrofuran, anhydrous acetonitrile or dry acetone; employed in the reaction time to 24 hours; reaction temperature employed is 0-50 ° C; wherein the compound of formula (XIII) and formula (XIV) wherein, using an alkaline agent is selected from triethyl amine, pyridine or 4-dimethylaminopyridine; the solvent is employed in anhydrous dichloromethane, anhydrous chloroform, anhydrous tetrahydrofuran, anhydrous acetone or anhydrous acetonitrile; reaction time employed is 1-¾ hour; the reaction temperature employed is 0-50 ° C.
FI83424B (en) 1991-03-28 Foerfarande Foer framstaellning of nya terapeutiskt anvaendbara and substituted androsta-1,4-diene-3,17-diones.